By the time I was six, I was already searching for chapter books to quench the burning desire I had to read books that would last longer than thirty minutes. And although I was already an advanced reader, I wasn’t quite ready to give up illustrations. So, my mom presented me with The Little House in the Big Woods by Laura Ingalls Wilder, launching me into a faithful obsession that would consume the next four years of my childhood. 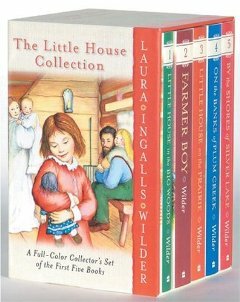 The Little House books were just amazing to my younger self, the story of a girl my age growing up in such a different time, but still facing the same struggles as I did, like getting along with a sister. By my seventh birthday, I had read the entire series, and a little part of me had grown up with Laura (which could possibly explain why I never did understand my parents’ use of the “you’re only seven” excuse). These were the books that taught me about family, and because of them, I was able to appreciate my family even more. Laura was always more than a drawing of a little girl or a “Half-pint” to me. She was another friend. Most of the books I read in the latter parts of my childhood years were linked to The Little House books. I discovered that there were also books about Laura’s mother, grandmother, great-grandmother, and daughter, and the hunt began for every copy. Sadly, we couldn’t find all of them in our bookstores, but I devoured those that we had found, almost as soon as I got them, always ready for another, much to my parents’ wallet’s dismay. So, these were the books I chose to reread because they had taught me more than any other book ever has. The thing it, though, when I first read these books, I was Laura’s age at the very beginning of the series, and I connected with her more when she was six and seven. Now, at sixteen, I can relate to the latter of the series, and that pressure to do well in school, and that fluttering beginning of romance. These books are timeless, with lessons and meanings relatable at any age. Even now, after hundreds of rereads, Almanzo’s proposal still coaxed a little gasp and a grin from me. That’s the beauty of all books, I think. That they can last you a lifetime, and still make you feel like you did when you were six years old, wondering how on earth anyone could live in a little house in a Big Woods. Emily is a high school student who often contributes reviews to this blog. You can see why.